We've been seeing a lot of snails in our place and I just couldn't let this pass :) So I paid a visit to the library and borrowed a few books about it so we could do a little study on them. We've never done this before as I am really scared of anything that crawls, but my son was into it and excited so I just have to give in. 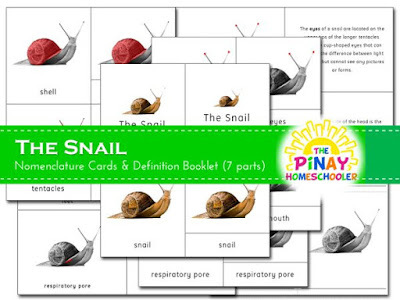 Snail Nomenclature Cards and Definition Booklet by The Pinay Homeschooler. Click the image below for the link as well. A snail. We got this tiny fellow in one of our nature walks. Prior to our lesson, we've been reading books and learned about where the snails live and when do they usually come out from their hiding. So one day, after the rain, we set out to look for a snail that we can bring home. We followed what the book said: look for snails in dark places, under the rocks, the bushes or if in a surface that is wet or damp. It was fun looking for them and educational as well. My son knows exactly where to look for them! Once we have our snail, we put it in a tube (Safari Toob tube LOL) and brought it home for an observation. My son named the little fellow Sally. Seen on pictures below, we watched as Sally fed on the leaves, see how she moves and produces a slime to slide. Below we read about the lifecycle of a snail. At this point in time, we looked at the different parts of the snail. Mavi was more keen on the body parts as he kept on asking about the eyes of the snail. We used our snail 3-part cards in identifying the different parts of its body and read our booklet on how each of the parts function. I like how our nomenclature cards turned out. Before, I used to draw images but I love that we're using pictures for a more realistic approach. And at first I kept on questioning the size of our cards but I'm happy that I made it 3.5x4 inches, just enough for everything to be seen. We stopped here. There were a few more activities left for us to do but I can see that he was already tired. We will continue this next week as we also study the world of insects. The study of snail, as I mentioned earlier was something new and the fact that we've been seeing them everywhere helped in building up that eagerness to learn. He was really curious with this slimy creature and was very attentive in our discussions. It also helped that we read books about snails beforehand for a head start. Our snail study did not end here, you can check the second part of our activity here (Molluscs: The Study of Snails Part Two). For more FREEbies and learning aids, please check The Pinay Homeschooler FREE Downloads and FREE Learning Materials. Follow Pinay Homeschooler's board Zoology Unit on Pinterest. Another extension to our continent unity study is learning about the natural resources that are mined or abundant in certain parts of the world. This is a new topic that I introduced to Mavi and he definitely loved it. He was very interested in learning about the products of each continent, what they look like as raw materials and how these materials are processed so the people can use them.